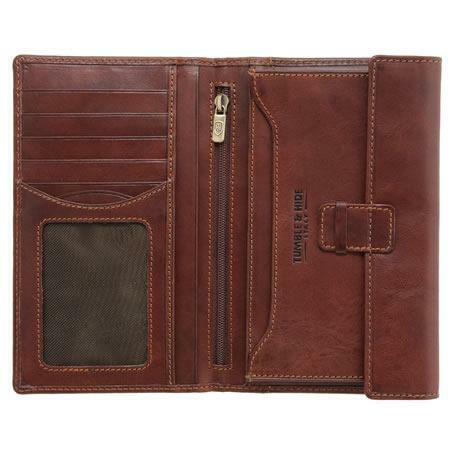 Tumble and Hide Gents' Long Leather Jacket Wallet. Men's long jacket wallets are increasingly hard to find these days. We have however managed to source a very stylish example from Toni Perotti's Vegetale range. Italian craftsmen carry out the environmentally friendly vegetable tanning process. This results in the distinctive Italian leather smell and ensures that each product gains its own individual character or patina as it is used. Shown here in brown, this wallet is also available in black and cognac and opens to reveal; zipped section, 5 credit card slots and I.D. window plus the traditional tabbed note pocket. Please consider the options below before adding to your cart.